Having a personal interest in candle magic, when I went to the Folklore, Magic and Mysteries: Modern Witchcraft and Folk Culture in Britain exhibition in Brighton yesterday I was excited to see Doreen Valiente's Book of Shadows open at a candle magic spell. Take a candle of suitable colours and dress it with oil as described under "Candle Burning" concentrating on the purpose of the rite. Light the candle and the incense, and recite the Fire Rhyme. As usual the burning of suitable incense helps the rite, though the rite can be performed with the candle alone. Have the wish read written down on a slip of new paper in the Theban Script, preferable in [word obscured]. Lay this slip of paper upon the pentacle. That tout! A tout tout! Also displayed among items from Doreen Valiente's altar is her pair of cobra candlesticks. You can see them in the photos to the right and at the bottom. 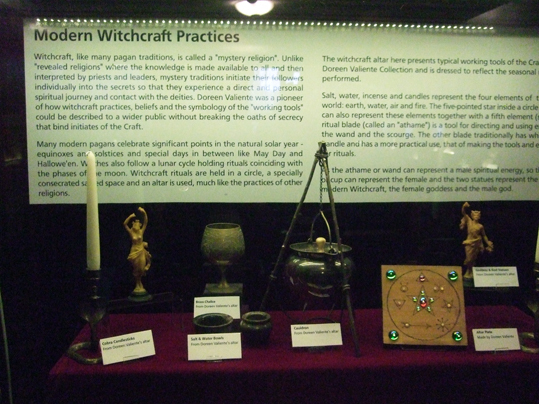 Do visit the exhibition yourself - anyone interested in witchcraft, folklore and paganism will find something of interest there. Folklore, Magic and Mysteries: Modern Witchcraft and Folk Culture in Britain is on at Preston Manor, Preston Drove, Brighton BN1 6SD, which is open from Tuesday to Sunday each week. 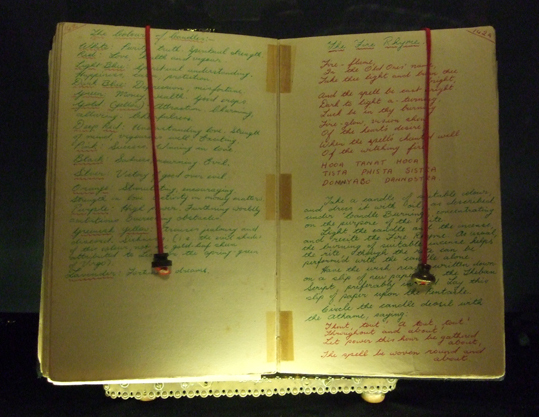 It contains items from The Doreen Valiente Foundation collection. You can find out more details here: http://brightonmuseums.org.uk/prestonmanor/.